Sewing leather brings a whole new range of possibilities to the home seamstress or small-scale designer. There are a number of things to know about sewing with leather on your home machine, besides the obvious rule of not using leather that is too thick. As you will see, however, leather is a rewarding and versatile material that provides durability and beautiful texture to wardrobes of all kinds. You can use leather to add a touch of modern or rustic to any wardrobe. A popular option for leather sewing is a handcrafted wallet. But bags are also a great choice, with or without lots of hardware. If you’ve got a lot of sewing mojo, you could even try a leather jacket or gloves on your home machine. These tend to have tight corners and more pieces, but they are a beautiful item to have handcrafted in your closet. Many people don’t know about leather needles, but these are really important if you are going to be sewing with leather. The needles have a spade point, which is a bit longer than the tip on a regular needle. It helps make a nicer seam on the leather, which is a bit tougher than regular fabric even if it’s thin. Choose a leather needle that is the right gauge, but not one that goes over the advised weight for your sewing machine tension. As a general rule, you should go with a heavier needle for thicker leather. Remember that leather needles dull faster than regular ones, so buy extra and change them often. Stickiness can be a problem with certain machine feet and leather. This may not affect you if you have a special pressure foot system, but often people find that they need a different foot than the standard one. There are a couple of options. You can try a teflon foot, which reduces stickiness because it isn’t metal. These are often white-colored or similar from the teflon coating. You may also find them under the label ultra-glide or non-stick. They do just what the name implies, and are a great option for most fabrics that are like leather also, including faux leather. There are also roller feet, which are made of metal or plastic (sometimes a combination). The don’t stick to the fabric, though, because they have two or three rollers in the feet to help the fabric glide. Lastly, you could try a walking or even-feed foot. This foot works using its own feed dogs so that the fabric is fed through two sets of feed dogs: the ones on the foot and the ones on the sewing machine deck. The two sets of feed dogs work together to feed the leather evenly through the machine, making this a really good option for even sewing. The correct thread for sewing leather is polyester or nylon. While this may seem counterintuitive, since cotton would be an all-natural choice to work with the natural leather fabric, you will want to avoid using cotton because the tannins in leather can cause cotton to deteriorate over time. You don’t want your thread to disappear over time or visually, so consider using a heavier polyester or nylon thread. Some people prefer a thread that is specially labeled for topstitching for that application to make sure that the sewing looks nice and sturdy. Longer stitches are an important part of sewing with leather. They keep the seams from breaking, but it’s also an aesthetic look. 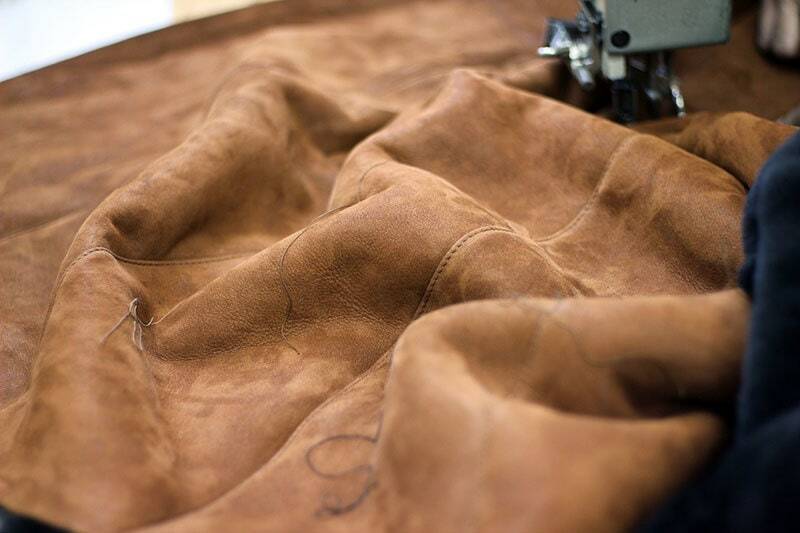 You will find that using longer stitches is a necessity as you make samples because small stitches can sink into the leather too much, stretching the thread and creating creases in the leather. You might need to work on your tension a bit as you sew. While you don’t want it too loose, the seam may benefit from a bit of loosening compared to what it would be with cotton or silk fabrics. Pins will leave permanent holes in your leather, so use double-sided tape (not where it will get into the feed dogs or needle) or binder clips. It’s important to test your tape or clips on a sample of the leather to make sure they are neither too heavy or too light. This leads us to the next important point. The way leather shows wear and use is part of its charm, but you don’t want to show too much wear from the sewing process! So make sure that you carefully test your sewing techniques on a sample scrap. You will want to test a few things. The first thing you need to test is the thickness of the leather your home sewing machine is able to work with. Heavier duty models such as those shown here handle leather pretty well, but many others don’t. Just make sure you don’t overload your machine or bend your needle. Then you need to test the speeds you can go, both for machine and hand. Don’t try to push your machine too hard, or go so fast that the leather slips through your hands. Also test your clips and tape as well as the length of the stitches and different thread types. With these thoughts in mind, you are all set to start experimenting with sewing leather on your home machine. You will find many beautiful leathers out there, each with it’s own texture and finish. As you collect this textile, keep many test samples to ensure your best results. Don’t forget to be creative as you have time to experiment, and try different stitch samples, thread colors, embroidery, and other embellishments on this fabulous material. Keeping a samples library will not only allow you to save money on leather since you can be more accurate the first time you sew, but it will give you many ideas to work with as you expand your repertoire with this material. There is so much to do when working with leather, and since each piece is unique the finished product shows a lot of love in the making. I never thought that leather item can sew in the home, but your idea has blown my mind. Now I am looking forward to sewing leather items in the home. thanks for sharing your ideas. I AM NEW AT SEWING AND THIS TUTORIAL SEEMS VERY EASY TO ME, UM GONNA FOLLOW THIS TUTORIAL WHILE SEW LEATHER ITEM, THANKS FOR SHARING THIS, KEEP IT UP.